Join us on Saturday 9th April, at Bishop Hannington Memorial Church for our annual ‘Taste and See’ evening. You are invited to an evening of interviews and entertainment, accompanied by light refreshments. 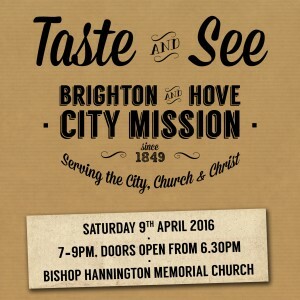 ‘Taste and See’ is an opportunity for our supporters, old and new, to find out about the latest developments at the City Mission. Click on the image below the invitation for the evening. We are so thankful as a City Mission for Chris and Emma who have decided to support us through their wedding! What an amazing idea, and what a beautiful way to raise money for charity. This is what Chris and Emma wrote about why they are blessing us in such a way. “We’re excited to be getting married at Bishop Hannington Church, Hove on 2nd April 2016. 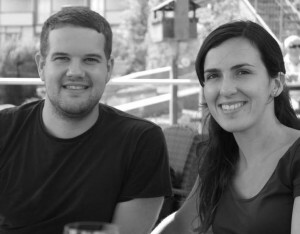 As we began to plan our wedding we started to think about all the money that was to be spent on us, we wondered whether there was a way to use this day as an opportunity to give to others too. We decided to still have the usual wedding gift list to help us set up our home, but we also created a Just Giving page for Brighton and Hove City Mission, so that our wedding day wasn’t all about taking, but about giving as well. Last week our Schools Team alongside Festive, and Off The Fence’s schools team held our termly Christians in Education event. With our very own Lloyd hosting the evening, we heard from three inspiring speakers, looking at the subject of how to get a good work life balance, served up with the usual Starbucks coffee and copious amount of homemade cake. The first, Gillian Carr, spoke from her many years experience as a Maths teacher at Cardinal Newman School. She started by saying that the same piece of work could take 5 minutes or an hour depending on how long you had. And the longer you spent on a piece of work didn’t necessarily improve the quality! She also helpfully reminded us that all our work is given to us by God and with the right attitude we can enjoy all He gives us. Next up was Blatchington Mill student Anna Cristin who confessed to having lots of things to fill her time and that God sometimes got demoted to the bottom of the to do list. However she spoke of now trying to see God in every part of her life. One way she’s done this is to start a Christian Union at Blatchington Mill which she’s really passionate about! Finally we heard from Rich Miles who teaches year 3 at Aldrington Primary School. He finished by saying that perfection is impossible but he does all he can to strive for excellence. There is always time to do the important things! Thanks to all who came and especially to our 3 speakers – another excellent evening! Our next Christians in Education event is on 27th April, watch the video below to see more.